We are proud to welcome you to Giddings Middle School, an academically and athletically challenging home for over 400 young Buffaloes and 45+ staff members. The students, teachers, and staff of Giddings Middle School will continue to strive for excellence in an environment rich with expectations, character, tradition, and diversity. Wednesday, April 17 - Dual Meet @ Bastrop HS 4:00 p.m.
Saturday, April 27 - Bastrop HS @ 8:00 a.m.
Saturday, May 4 - District Tennis Meet - Bellville @ 8:00 a.m. Thank you for your support of GMS Tennis. The GISD Spring Band Concert will be held on Tuesday, April 30th. The concert will be held in the GHMS Cafeteria beginning at 7:00 p.m. The concert will begin with the Sixth Grade Beginner Band, followed by the Seventh and Eighth Grade Band. The Giddings Middle School Bands will perform under the direction of Mr. Anthony Tiger. The final band to perform will be the Giddings high School Band under the direction of Mr. Brian Stewart. Giddings Middle School students will be taking Spring Benchmarks on Monday, April 22, 2019. Sixth and Seventh Grade students will be taking the Math Benchmark. Eighth Grade students will be taking the Science Benchmark. Data gathered from these benchmarks will be used to develop lessons and activities to help prepare students of the upcoming STAAR Assessments. Giddings Independent School District and Giddings Middle School will be closed on Friday, April 19, 2019 in observance of Good Friday. School will resume on Monday, April 22, 2019. On behalf of the entire GMS Faculty and Staff, we will you a safe and Happy Easter. On Wednesday, October 10th, GMS competed at the District Meet. The boys' team took first place and are the District Champions!! The girls' team competed well and earned a 3rd place finish! Lady Buff, MaKinley Kylberg ran for a First Place Finish with a time of 13:37. Top runners for the girls included: Catherine Rodea in 5th place (14:20), Kallie Wilson in 15th place (15:04), Taryn Kleinert in 17th place (15:54), Journey Wolridge in 27th place (17:08), Kassy Pedroza in 29th place (17:16) and Ana Garcia in 34th place (17:53). Other team members were: Lisbeth Rubalcava, Karla Moreno, Amy Sanchez, Marlene Moreno and Banelly Bernal. Great Job Girls!! Buffalo, Kayden Bloodworth came in 2nd with a time of 11:59, Andrue Rodriguez in 3th place (12:14), Sebastian Flores in 7th place (12:38), Cyrus Kubena in 8th place (12:40), Kolbie Clemons in 13th place (13:07), Arturo Espinoza in 18th place (13:42), and Brookland Namken in 22nd place (13:58). Other team members were Gabriel Hernandez, Jordan Lucio, Pedro Juarez, Derrick Martiniez, Rex Razz, Billy Roschetzsky, Rafael Salazar, Tieson Sherman, Harley Sullivan, Brian Hicks and Hunter Daniels. Way to Go Buffs! Congratulations to our athletes and coaches on an AWESOME Season! 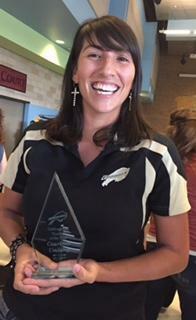 Mrs. Umlang, 8th Grade Pre-Algebra and Algebra teacher at Giddings Middle School was named the 2017-2018 Teacher of the Year. Mrs. Umlang is a graduate of the Giddings Independent School District. She attended Sam Houston State University and graduated with a Bachelor of Science Degree in Mathematics. She began her teaching career at Brenham High School where she taught Algebra for one year. Mrs. Umlang began teaching at Giddings Middle School in 2008. During her career at GMS she has touched the lives of many students. Her love of teaching and her ability to connect with her students has opened up the world of Math to many 8th Grade students. She is a dedicated teacher and huge supporter of the students of Giddings Middle School. In her spare time, Mrs. Umlang enjoys riding horses and taking care of her dogs, cats and baby calves. Congratulations to Courtney Umlang, 2017-2018 Teacher of the Year! Click to learn more about your child's state assessment (STAAR) scores.